Tuningen. Ready to launch: For the first time U-Turn offers an Acro-Tandem wing. But the Twinforce X3 will not be sold to everyone, only to pilots who proved to be skilled enough to fly this wing. As they take a huge responsibility for their passengers and have to react very prudent. Since a few years ago we are asked, and even assailed to produce an acro tandem wing”, reports U-Turn co founder Thomas Vosseler. In the past the U-Turn prescinded from selling an acro-biplace wing, because the demands on the wing and the welfare of pilot and passenger were and are still in the foreground: “Tandem flights are a great to enthuse people to the sport. But we were in doubt if passengers could stand an acro flight,” admits Vosseler. The forces are high. 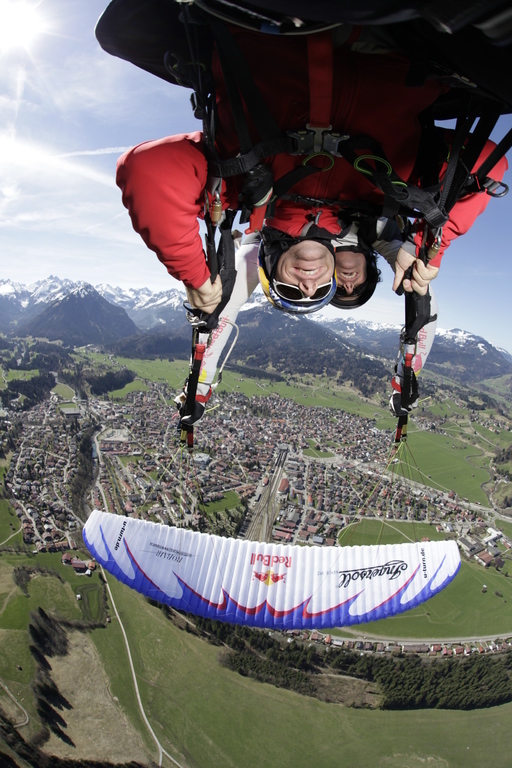 To face the accumulating inquiries for acro-tandems and to gain authoritative experience U-Turn chief designer Ernst Strobl designed an acro tandem basing on the THRILLER 2k11 for World cup star Pal Takats, who did now more than 10,000 infinity tumbles with passenger. His event for Red Bull TV together with Hannes Arch made furor too. The flights of Pal clearly showed that the wing can handle the immense loads, if the right design techniques are applied“, resumes the chief designer. This is valid for the flight characteristic of the wing too. In spite of its size the acro tandem has to have a good dynamic and the wing has to fly extra stable and this within a wide weight range due to different passengers. “It is impossible to scale up an existing acro wing, it is impossible because of the reason that on a solo wing not every cell has to be connected to the riser system. This is different on the acro tandem” knows Strobl. Until the latest generation of the THRILLER reached his actual durability the pilots like so much now, many line sets were replaced. “Partly, so we have to admit, we reinforced the lines and their attachments of the THRILLER by the factor 1.7 to 1.9 over the calculated values. This is far more as we expected from experience of the last years”, announces Strobl. Now, as the acro tandem of U-Turn is offered, then by the reason that the new features of the THRILLER X3 give an extra portion safety. The combination of the PPN- and the PPN plus-system, the Extended Aeration Systems in the top sail, the Pressure Balance Valves in the bottom sail and in addition the optimized cross ports give the extra stability and safety needed under bad angels of attack. This is obligatory for an Acro wing from U-Turn. Stability: Yes perfekt, durability: Yes, perfect too. The task of now is the refining of dynamic. “There are many lines with noticeable diameters decreasing performance” so Strobl. 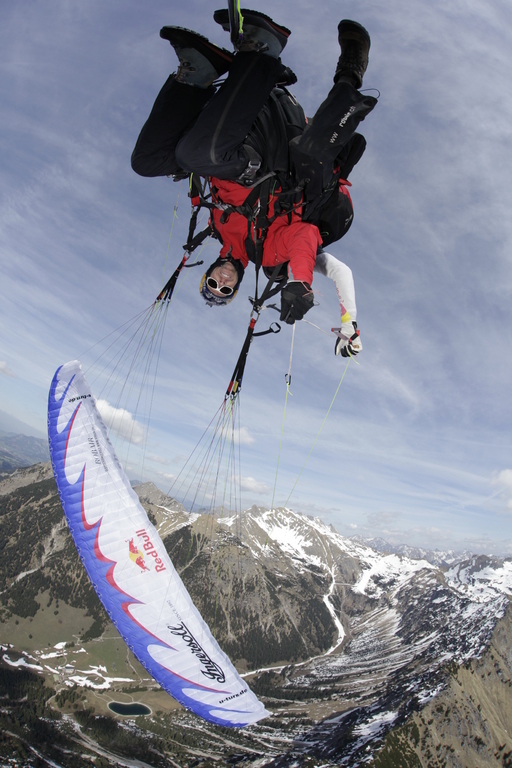 However to have sufficient dynamics for all the acro tricks Strobl is refining the line setup of the Twinforce X3. But the end of this refining is foreseeable, the high tech features of the wing ofer a lot of reserves to push the wing to the perfect dynamic.